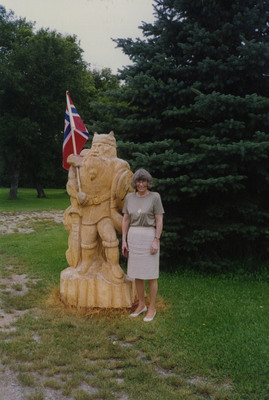 Rosemarie Myrdal standing next to a wood-carved statue of a Viking while visiting Cottonwood Farm in Manvel, North Dakota. Cottonwood Farm was owned by North Dakota House Representative Dagne Olsen and her husband Duane Douglas, "D.D." Olsen.